KUWAIT: Kuwait Stock Exchange (KSE) ended October with mixed performance. The Price Index closed at 5,775.36 points, up by 0.86% compared to the closings of the month before, the Weighted Index decreased by 0.01% after closing at 388.37 points, whereas the KSX-15 Index closed at 924.30 points decreasing by 1.15%. Furthermore, last month’s average turnover decreased by 6.78%, compared to the preceding month, reaching K.D 12.13 million, whereas trading volume average was 148 million shares, recording increase of 1.44%. The stock market indicators witnessed a mixed performance at closings, whereas the Price Index was able to increase as a result to the purchasing trend that included many small-cap stocks in particular, in addition to the speculative operations that included many of the same stocks too. On the contrary, and despite the random purchasing operations that included some large-cap stocks during few session, especially in the Banks section; the profit collection operations that were present also were able to push the Weighted and KSX-15 indices to end the monthly trading activity in the red zone. Also the positive results disclosed by some companies and banks for the third period of the current month contributed to improving the traders’ mode, which positively affected the three market indicators at sometimes. In addition, and despite the negative start that market initiated October trading with, where the three indicators witnessed a noticeable decline in the early sessions of the month affected by the selling pressures and dropped liquidity levels; the market was able to resist the selling pressures thereafter and was able to compensate its losses supported by the purchasing powers that concentrated on the companies’ stocks of good fiscal results, in addition to the speculative operations that were present during the month, before the profit collection operations that came in the last week of the month to limit the Price Index’s gains, and push the rest of the indices to the monthly losses zone. The market cap reached by the end of October KD 25.76 billion, declining by 0.14% compared to its level in September, where it reached K.D. 25.79 billion then. On an annual level, the market cap for the listed companies in KSE lost 7.94% of its value at end of 2014, where it reached then KD 27.98 billion. For the annual performance, the price index ended last month recording 11.63% annual loss compared to its closing in 2014, while the weighted index decreased by 11.51%, and the KSX-15 recorded 12.80% loss. Eight of KSE’s sectors ended last month in the green zone, while the other four recorded declines. Last month’s highest gainer was the Real Estate sector, achieving 4.66% growth rate as its index closed at 968.58 points. Whereas, in the second place, the Consumer Goods sector’s index closed at 1,100.40 points recording 3.31% increase. The Industrial sector came in third as its index achieved 1.26% growth, ending the month at 1,079.42 points. On the other hand, the Insurance sector headed the losers list as its index declined by 5.35% to end the month’s activity at 1,054.13 points. The Consumer Services sector was second on the losers’ list, which index declined by 3.16%, closing at 993.71 points, followed by the Oil & Gas sector, as its index closed at 781.81 points at a loss of 2.72%. The Real Estate sector dominated total trade volume during last month with 987.91 million shares changing hands, representing 35.13% of the total market trading volume. The Financial Services sector was second in terms of trading volume as the sector’s traded shares were 24.54% of last month’s total trading volume, with a total of 689.94 million shares. On the other hand, the Banks sector’s stocks where the highest traded in terms of value; with a turnover of K.D. 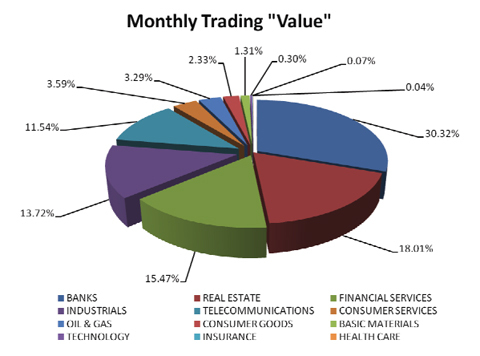 69.86 million or 30.32% of last month’s total market trading value. The Real Estate sector took the second place as the sector’s last month turnover of KD 41.50 million represented 18.01% of the total market trading value.